Keep your lips soft and luscious-looking all winter long and enter this competition to win a Palmer’s Cocoa Butter Formula Lip Balm Winter Beauty Bag, which includes Palmer’s Cocoa Butter Formula Swivel Stick SPF30, Palmer’s Cocoa Butter Formula Moisturising Lip Balm with Vitamin E & SPF 15, and Palmer’s Cocoa Butter Formula Dark Chocolate and Peppermint Lip Butter. For soft, smooth, silky luscious-looking lips all year-round look no further than the UK’s favourite Cocoa Butter Formula*. All Palmer’s Cocoa Butter lip products are deliciously cocoa scented and have a long lasting moisture protection for the softest kissable lips. New Palmer’s Cocoa Butter Formula Swivel Stick SPF30 is a real beauty essential that can be used on lips, cheeks and other exposed areas in need of moisture protection. 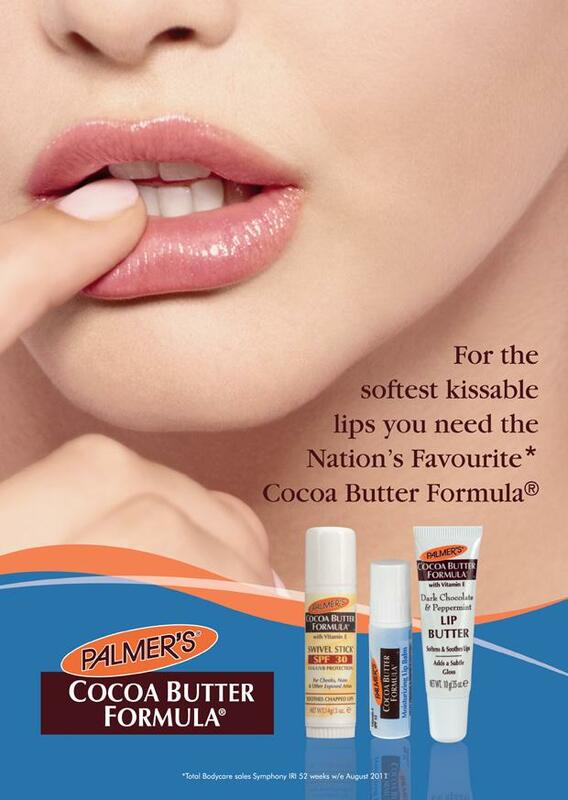 For an everyday intensive treatment try Palmer’s Cocoa Butter Formula Moisturising Lip Balm with Vitamin E & SPF 15. And Palmer’s Cocoa Butter Formula Dark Chocolate and Peppermint Lip Butter will deeply condition and leave a glamorous hint of gloss on top of this season’s must-have plum lipsticks. Who had a hit with ‘I Kissed A Girl’?